What is a Product Category Rule (PCR) and why is it important? A PCR establishes an internationally recognized set of rules, requirements and guidelines to test and report on a product's impact on the environment. That means that every product in a given industry is tested and evaluated in a clear, consistent way, allowing consumers to make better-informed decisions. This global PCR is the first-of-its-kind and encourages hand dryer manufacturers worldwide to evaluate the environmental impact of products with a common approach. That means less market confusion in this new age of transparency. With over a century of experience developing more than 1,500 standards, UL Environment, a business division of Underwriters' Laboratories (UL) was chosen to develop and publish the PCR. The rule established product evaluation methods used to determine key values such as dry time and energy consumption through industry consensus. The original, patented, high-speed, energy-efficient XLERATOR® Hand Dryer recorded an 8 second* dry time and 3.7 Wh* accumulated energy per use, the XLERATOReco® Hand Dryer recorded 10 seconds*, 1.7 Wh*, while the ThinAir Hand Dryer recorded 14 seconds*, 3.7Wh*, respectively, making them the first-published in the industry. The hand dryer PCR is the culmination of more than a year long process and is the first step toward the development of an Environmental Product Declaration or EPD, ecolabels that govern one or more product category. Excel Dryer has been manufacturing American-made hand dryers for over 50 years. The original, patented XLERATOR® Hand Dryer revolutionized the industry and created the high-speed, energy-efficient hand dryer category. Excel Dryer again solidified its role as industry leader by initiating and chairing the committee to publish the first, global PCR with UL Environment. "The hand dryer market, like so many others, is inundated with knockoff products and manufacturers making unsubstantiated claims. Architects and specifiers may approve 'or equal' products that are not true equivalents. The same is true for buyers looking to compare and purchase the best product for their facilities. All products need to be evaluated by the same set of rules and reporting guidelines — for hand dryers, that rule is the new, global PCR from UL Environment." - William Gagnon, Vice President of Marketing. 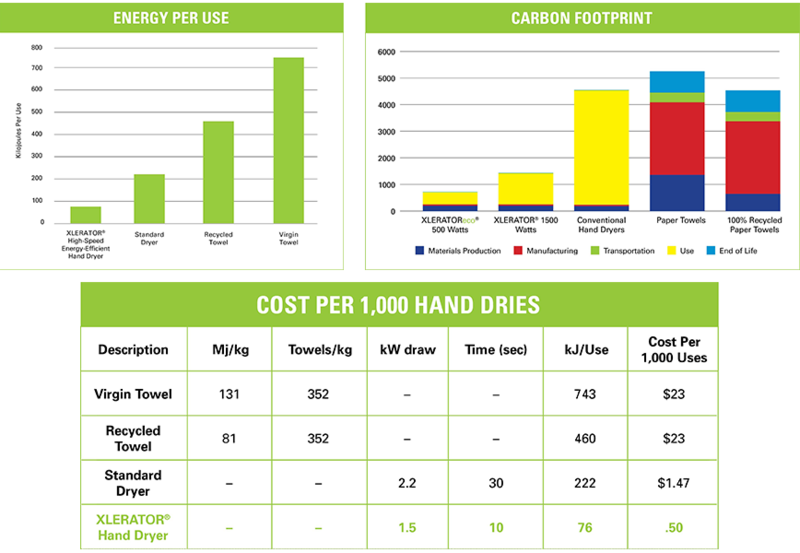 © 2019 Excel Dryer, Inc. - * Dry time and energy use testing performed by SGS International on standard XLERATOR/XLERATOReco Hand Dryers with 0.8" nozzle to 0.25g or less of residual moisture, pursuant to the UL Environment Global Product Category Rules (PCR) for Hand Dryers.